Nutribullet is a blender similar to Magic Bullet which claims to turn ordinary foods into superfood in which it potential can reduce a number of health related problems. The Nutribullet is powered by a 600 watt motor and an extractor blade which claims it will breakdown everything and extracting all the essential nutrients so it can be easily consumed. One of the biggest claims according to their website is the product does not juice or blend but extract. Questionable? Included is the Natural Healing Foods book which offers tonnes of recipes including Toxin Cleansers, Immune Boosters, Energy, Free Radical fighter and more. Like other bullet blenders you also get one milling blade, power base, a tall cup, 2 short cups and 2 resealable lids. The cups are made of BPA free plastic. 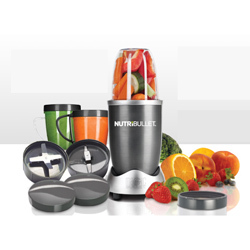 With your help we can reach more people and let them know about Nutribullet whether this product works or not. Should you buy the NutriBullet? If you want to have more options then a regular smoothie maker, yes. I have had mine since March 2013 and I have only used the other blade for nuts once to check it out. It does have lots of recipes that I have tried and I also put carrots in it and it did just fine. Cleans up easy by hand, I don't have a dishwasher. It is very loud with only 1 setting option "cyclonic action" think vaccuum cleaner loud. I have a smoothie everyday with spinach, fruit like banana, blueberries or strawberry, flax seed, and whey protein. If your really into pre-weighing your stuff it works super, if not there is just 1 magical fill line. One. Don't go over it. Floods over. Maybe once I start making other things I may like it better but for now I'm not sure it was the best investment of $80 bucks (with coupon at Bed Bath and Beyond). Within 6 days my skin was nicer. Smoother, clearer and alive. While I didn't lose any weight, I sure felt better all round. I've not had any problems with leakage. A friend had, but she said she couldn't always tighten the blades onto the cup. Well worth the purchase price. I now want one for my workplace! I Have had mine for 5 months and it leaks the motor stopped. and a brown looking oil came out dont wast your money. Not a durable product DO NOT BUY THIS! I bought mine from tv infomercial, at first it worked well. I used it 2-3 times a week. After 3 months, I wanted to use it but it did not work at all, I could not even set the cup into the base. Luckily I purchased a life time warranty at additional cost of $24.99. Calling the company but no numbers are working, as if they disappear after selling a faulty product. I see many have had leaking down into the motor. This is caused by overfilling the cup. It has happened several times for me. I immediately turn it upside down over the sink, and spray with the sink sprayer, then let dry upside down. It has worked wonderfully for me. I love it, got one for my daughter and she loves it also. I highly recommend, just be careful to not fill past the fill line. Ordered this product on oct.3 excited that it finally arrived after 4 week's. ( excited) followering all the instructions,put my fruits and veggies in turn it on everything appeared to be ok. but it leaked into the motor the first time i used it. I bought the NutriBullet so I can have my daily amounts of fruits and veggies because my past blood work has failed me. With that said, I not only get my daily amounts, it has given my energy, well rested sleep, clearer skin and losing unwanted pounds! I don't know how NutriBullet does it but I've been going to Jamba Juice and Elixir Bars daily in the past and it has not done what NutriBullet did for me in 2 weeks. I consider this a mirachle machine. It's actually pulverizes fruits and veggies together. It's a smoothie consistency not a juice so if you're looking for a juicer NutriBullet isn't it. It's easy to clean! Space saver and very powerful. So running it long is not a good idea. When putting veggies like brocoli you need to cut it in half or in 3's. Apples the same way. It just makes it easier and faster for the extraction. You need to screw it tight or it will leak. Don't fill water/liquid over the max line or it will leak. Don't over fill with fruits and veggies or it will cause pressure and it will leak. READ instructions. I haven't had a problem, only one time when I forgot to fill water below or on the max line - thats my fault. Its the best investment I've made, that's for sure. Arrived on a Friday I was excited to try it out so Saturday I took spinach, berries, banana, and flax seed respected the max line, placed it on the base it ran for about 1/2 second and STOPPED!! Dead! I called and they are going to send a new base. I ask for rush shipping (at their expense) they said no. So now I have to wait for another week to ten days and hope the new one works. I am on a fixed income; therefore, my informercial buying days are behind me. My doctor has been riding my heinie about losing weight. I have been desperate. Nothing worked. Finally, after researching, I found that not one, but three of my rx's casuse weight gain. I have had a Magic Bullet for some time, and use it all the time; After seeing the Nutribullet on TV, I researched, and decided to, pardon the pun, bite the bullet. I bought mine at Walmart, for $99. I have used it twice a day for about 2 months now, and broke thru the plateau on my weight. I have dropped from a size 14 pants and XL top to sizes 12 and large. Talk about thrilling. I still have 30 or so pounds to go, but I know that for me, this appliance has been a literal life saver...love this thing!! DO NOT BUY THIS PRODUCT!!!! I bought this and within 4 times of using it it leaked down into the motor and stopped working....I called the company direct and they told me I could not return it for a refund. Apparently after 30 days of SHIPPING which it takes 2 weeks to arrive, you can no longer return it...they wont even give you an address to return it. In my opinion, any place that will not give you a refund if something is not satisfactory is selling an inferior product.....IF YOU THINK YOU ABOSOLUTELY NEED TO TRY IT, buy it from target or somplace tat will take it back!!! BUY A BLENDER!!!! Just ordered the Nutriblast.Looking forward to seeing if this machine really works.I love fruits and vegetables, so i am sure this will be a good investment.Will comment on the nutriblast once i have used it for a month. I have had this product about a week now, and have owned any number of blender / juice products in the past. The NutriBullet can blend almost anything in no time flat. I do a morning smoothie that includes greens, nuts and fruit. It's done in 10 seconds and very easy to clean up. This is the first time I've had a machine that really is so easy that I actually use it. Given the size of the cups, it has limitations, but for what it is it's great. I ordered this one Sunday morning because I was looking for and researching juicers. I have heard that juicers are good but they spit out the best part of the fruit and they are a pain to clean. I got this thing almost 2 weeks later and I love it. I can get my daughter to drink her spinach (she is a very picky 12 year old)I mix up a "nutriblast" everyday it gives me fantastic energy, my skin is looking better, and I have gone down a notch on my belt in less than a week. It is a very affordable way to get your fruits and veggies and you don't even notice. I couldn't eat as much salad as I put in a nutriblast with a little bit of pineapple or berries and whir it up and I have a great day! Awesome! check out their facebook page and see other happy customers!